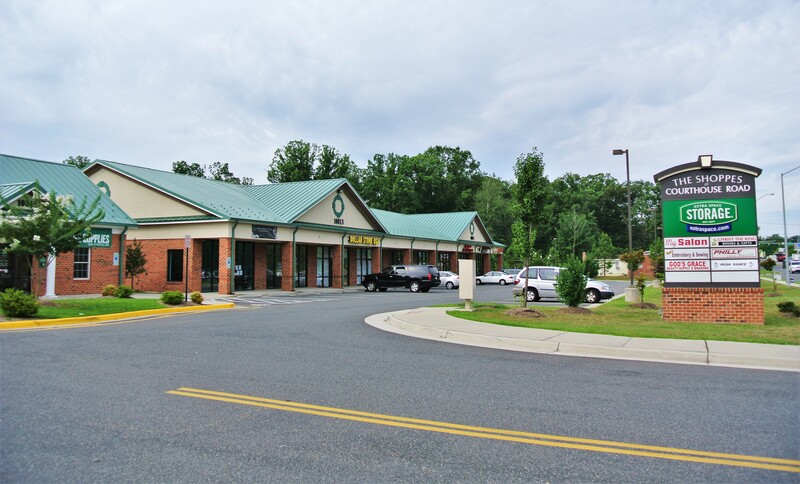 The Shoppes at Courthouse Rd is a well maintained neighborhood center offering over 10,800 sq. ft. of space. The building is comprised of nine 1,200 SF condominium units with co-tenant to include hair salons, gift store, deli, dance studio as well as Extra Space Storage directly behind center. Ideal for over stock/seasonal inventory. There is currently (1) one space available for lease in the multi-tenant building. This 1,200 sq. ft. space is fully built-out and could be used for retail or office. BUILDING DESCRIPTION: Insulated glass store front, split seam metal roof; Brick veneer exterior (four sides), decorative EFIS accents and sign band. Finished Space: Dropped acoustical ceiling and lighting. Finished Bathroom: Dry walled, commodes, sink, fan set. Carpeted floor, Ceiling insulation. Heat Pump: 4 ton, 10 Seer 3 phase. Ducts in place, conduit for phone to each unit. 3 phase electric, 200 AMP panel, individual electric meter and water submeter.